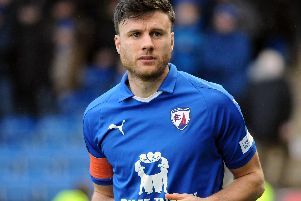 Drew Talbot is to leave Chesterfield after seven and a half years, as the Spireites release seven players. Talbot is the biggest name among the players departing the Proact at the end of their contracts, while Chesterfield have retained a trio of youngsters, namely Rai Simons, Jake Orrell and Jake Beesley. Players on their way out are Talbot, Chris Herd, Jordan Slew, Byron Harrison, Mani Dieseruvwe, Michael Onovwigun and goalkeeper Aaron Chapman. Talbot originally joined the club on loan from Luton Town at the start of 2009. He became a permanent member of the squad and went on to make 277 appearances. The Barnsley-born utility player began his career at Sheffield Wednesday and won the 2004/05 League One play-offs with the Owls. As a Spireite he won the League Two title twice. The 29-year-old helped plug Chesterfield’s gaps at full-back this season, on both sides of the pitch and also found himself in midfield. Herd has already been announced as a new signing by Perth Glory, while Slew will look to ressurect his career elsewhere having failed to break into the first team since arriving in February. It was hoped Chapman would push Tommy Lee for the number one spot, but he didn’t make an appearance between the sticks for the first team this season. Harrison, Dieseruvwe and Onovwigun have all gone out on loan this season, to Stevenage, Mansfield and Gateshed respectively. Manager Danny Wilson empathised with those departing. “It is a difficult time when players come to the end of their contract, with all the uncertainty,” he said. Of the players getting new deals, Simons has had the most significant part to play this season, scoring five times in 22 games. The forward joined Chesterfield from non-league Ilkeston a year ago. Orrell made one start for the Spireites, while Beesley has not made an appearance.